Playing Knights of the Old Republic 2 is a rite of passage. It's a trial or an education. When I first woke up dazed on the mining world of Paragus I was 14. I’d been raised to think that good is just good, the right thing is always right – be good, and you will do good. 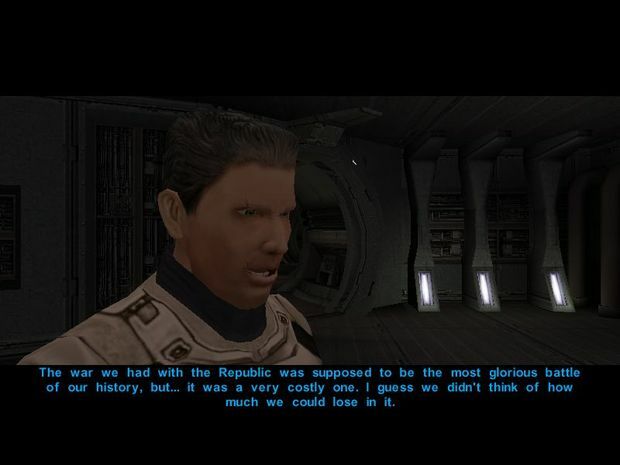 KotOR 2 took that idea of morality and spat on it and scorned it for being what it was: the unquestioned dogma of a child. If you hold your morality dear, KotOR 2 is not a game for you. The breakthrough moment was a scene carved into my brain forever. You are in the refugee sector of Nar Shadaar, a poor world controlled and exploited by the Exchange – a heartless criminal syndicate. You walk through the docking bay, past rubble, trash, and desperate people with nothing but the clothes on their back. One interrupts you as you walk, begging for money. 14-year-old me thought that to do the right thing; I must do what seems right – give the man some money. Surely, I thought, it would allow him to buy some food or maybe some new clothes, but no. What I did was make that man a target for the desperate – I made the man a victim of Nar Shadaar’s collective squalor. The Mandalorians are a war-like people. They seek greater and more glorious conquest constantly. There is no greater glory than testing yourself in lethal combat. They are not evil, but have a culture built upon physical strength. In the not so distant past, the Mandalorian clans fought, and were unified under a single leader, aptly named 'Mandalore the Ultimate.' Having tested their strength against each other, they sought greater challenge. They attacked worlds on the edge of the galaxy, slowly moving toward The Republic. The Republic considered stopping the Mandalorians as they lay waste to the Outer Rim – but the Jedi urged caution. The Mandalorians conquered closer, and still the Jedi urged caution. They slaughtered millions, bombarded planets with nuclear weapons, attempted genocide – and still the Jedi urged caution, mostly. 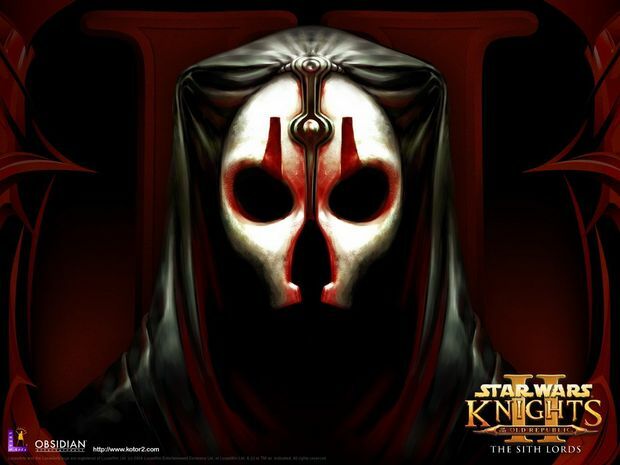 A group of Jedi, led by Knights of the Old Republic protagonist-in-remise Revan, dissented and urged the Jedi to change their position and encouraged military buildup. They did not listen, so when the Mandolorians finally attacked the Republic head on, him and his faction left the Jedi. Revan's Jedi quickly changed the course of the fighting. He pushed the Mandolorians back with the Mandalorian moon of Dxun seeing particularly nasty fighting. As the war went on, both sides became increasingly desperate. The Mandalorians used human shields and eventually The Republic stopped caring. 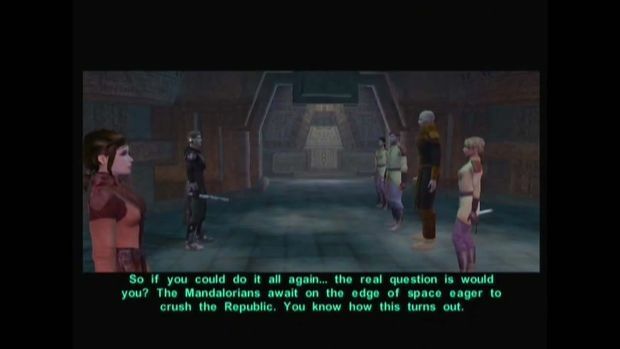 The Mandalorians fortified Dxun, and KotOR 2’s protagonist, you, used soldiers as fodder in the Battle of Dxun. As commanding officer, you sent thousands to a gruesome death, but one that ultimately brought victory. It was something you would do again. The real moral quandary starts at Dxun and ends at Malachor V. In the Battle of Malachor V, you made a choice. The near entirety of the Mandalorian fleet and the bulk of Republic forces clashed in a titanic battle above Malachor V. It was what the Mandalorians wanted, the ultimate test of strength. They would not show mercy, and you were losing badly. In the aftermath of the battle, the Jedi would get annihilated and the Republic would fall to its knees. Billions would die in the Jedi Civil War, a direct result of the Mandalorian Wars. Were you right to use the Mass Shadow Generator? Would you do it again, knowing the consequences? 14-year-old me had never been exposed to such discussions, and it blew my mind to see how grey things can get. I started to question my moral code. Doing good was not enough. I wanted to learn more about ethics. It is because of KotOR 2 (among a couple of other reasons) that I chose to study Philosophy & Ethics for GCSEs (a qualification for 14 through 16-year-olds for the non-UK folks in the room). In parts, it sated my curiosity. Religious dogma was questioned, new ideas were discussed, moral theories were debated, if only at a basic level. Not a huge amount of it was relevant to what I sought to resolve in the game, but it helped. When I played the game again a year into the course we’d just started the War Ethics module, it disappointed. War Ethics was, back then, simple. KotOR 2 was brain-bustingly complicated. The game offers you many points along the Mandalorian Wars where you could have done things differently. Would you have dissented from the Jedi, knowing all that would transpire? Would you change tactics on Dxun if you were to fight there again? And most importantly; would you use the MSG again, knowing the disastrous aftermath. Yes you stopped the Mandalorians, but crippled the Republic and wrought evil through allowing the Sith to flourish. 14-year-old me had no answer. 15-year-old me had no answer. So GCSEs were no help. They kept my mind busy contemplating the Problem of Evil and the morality of war at a basic level. I understood new things, but that knowledge was pointless. It brought me no closer to a solution to the Malachor problem. Then I took A-Level Philosophy and learned many theories to throw at the gauntlet. First on the chopping block was utilitarianism. Simply put: maximize happiness in each situation and minimize pain. Quantify matters where possible and use those calculations to work out the best course of action. Such a theory was pointless. I used the example of Nar Shadaar’s beggar in roughly half my work on utilitarianism as a criticism, to show that you’d need infallible powers of omniscience to be a good utilitarian. Utilitarianism is no help here. Next to saunter toward redundancy was Kantian ethics. It’s a difficult theory to explain, and one deeply flawed logically. It did no good. Rarely did it provide a solution to even the most basic of moral dilemmas in the game, let alone Malachor. It is a theory that tells you what is definitely wrong, but cannot tell you what is best, or even anything of the grey area in between. The theory is not applicable to the Malachor problem. Then came some religious ethics: Buddhism, Natural Law and Situation Ethics. The less said there the better. They were not applicable, and none made for compelling ethical theories to start with. No theory I learned, no matter how good it looked in the classroom, helped me resolve the Malachor problem. The theories, dreamed up by intelligent people and refined over time such that they dared tell me how to live claimed answers. The arrogance. Confronted with Malachor every last one of them simply shrugged, offering no satisfactory solution. 14-year-old me had no answers. 15-year-old me had no answers. 16-year-old me had no answers. 17-year-old me could again find no answer, not one, to Malachor. In spite of this, with each year I grew to understand the depth of the game. Where I used to see mere dialogue I learned to see ethics. 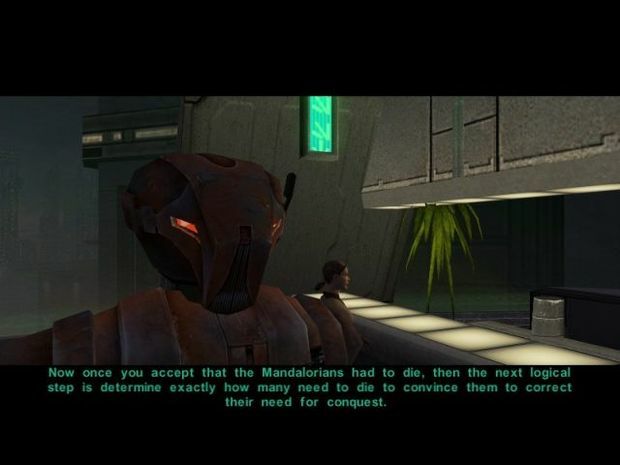 I saw Mandalore not as a bloodthirsty tyrant, but as a Realist. I saw Visas not as miserable and boring, but as a miserable and boring nihilist (though when her master is called 'Darth Nihilus' I'm surprised it took me that long). So the classroom content was fruitless, the game rejected everything I learned there. But throughout my education I’d been studying someone on the sidelines in my spare time: Machiavelli. A clever man with some strange ideas, Machiavelli felt familiar to me when I read his work. They were an almost perfect mirror to Kreia’s dialogue. I realized quickly that Kreia was based off of Machiavelli's ethical works. Where I saw Kreia I saw Machiavelli's description of morality, and one of the best representations of it in any medium. Machiavelli claims that as a matter of fact, morality is a lie. It is dogma, inherited through culture and tradition to form a concept of what is good. Nothing is right according to Machiavelli. An action can only succeed in achieving aims and that is that. It has no moral worth. Kreia tells you the same. She does not care if you play the game for evil or for good, she only cares that you play it well. She cares that there is justification behind every action, even if that justification is ‘I need credits.’ She still regards that as being better than ‘Grrr.. I’m evil,' and as with most matters of philosophy it took multiple playthroughs to understand. I’ve played KotOR 2 fives times now. I’m glad I did. And so we return to Malachor. Forget trying to do good. Consider what am I doing and why. Well, I was trying to stop the Mandalorians, and I achieved it. But it’s more complicated than that, I was trying to save the Republic and I nearly failed. I weakened it nearly to the point of destruction. But The Republic ultimately did not fall (at least until BioWare was at the reins again), I succeeded. So I played the game and I played it well. By Machiavelli the indefensible became justified, no matter how unsatisfied I was. But I could have played it better. So now I am 18, playing the game again. Four years of education and knowledge later. I understand what each character represents. I understand Bao-Dur’s conversion to Virtue Ethics. I understand G0-T0’s version of utilitarianism. I get it. There is nothing in that game that is new to me this year. I know all I can know about the game, so surely I will find a solution to Malachor? Surely I must. I didn’t spend four years learning some theology I couldn’t give a gizka about to get to the ethics modules, only to fail yet again to resolve Malachor. But moral solutions are not partial to effort. Once again, I failed. It cannot be done. There is no solution. There is no way I can accept the Exile’s decision, but equally no way in which I can justify not making it. 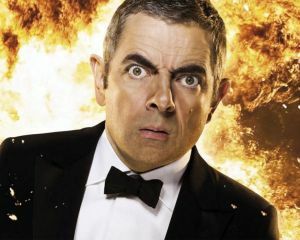 Apathy is death, and acting is death. Both would bring abominations onto the Republic, and both would bring it to its knees. It is impossible to quantify in either case, so I cannot tell what would have been the better option. Machiavelli offers a solution by stripping away the moral idealism, a solution that took four years to realize but one that feels like cheating. That's what Machiavelli teaches: that cheating in morality is fine, but it does not satisfy the depth of the game. What the Exile did was awful, but necessary. Not moral, not in the slightest, but justified. It took four years to get there, getting closer each year. With each playthrough KotOR 2 got deeper. I could appreciate it more, and in return it slapped me. It told me to come back in a year when perhaps, just maybe, I'd find a way to justify my answer. For the record, I would probably have retreated and activated the MSG as the Republic fleet fled. The Mandalorians die, the Republic is slightly better off, but the horrors that would follow would still remain. The best I can do is save a few more ships, an important difference, but one I feel no better able to justify. ‘I did my best’ just doesn't cut it when billions die in the aftermath. What went wrong was the result of millions of bad decisions compounding to create a nightmare, tracing where I could have done better was not possible. There were no good answers, only bad ones, though some were worse than others. The only way to parse the decision was to cheat; it was the only way to justify the unquestionably evil. It took four years, but the game got me to that level of understanding, showing me its depth as the years ticked past me. With every playthrough the game got better. For every theory I hurled at it, it educated me. For every idea I learned, I could see it in the game through the moral challenges and the thoughts of my companions; Bao-Dur’s deontology, Atton’s intuitionism and so on. It was my personal companion through morality, and it taught me that, sometimes, it is better to simply cheat.